Xenotes Choose Your Best Promotion!! Xenotes Choose Your Best Promotion. Purchase your best Xenote tour promotions at the best price. Make the most of your vacation time, and let the beauty of Mexico captivate your senses by exploring its unique settings. Enjoy water activities in any of our parks, or visit one of the Seven Wonders of the Modern World with our tours. Discover as many places as you want for an incredible price! PayPal Credits!! Now you can use PayPal credits for your vacation activities. Xcaret Admission + Xich�n Tour!! Xcaret Admission + Xich�n Tour!! 2 must-do tous in Cancun & Riviera Maya: Xcaret and Chichen Itza with transportation. Get ready for a big adventure! Travel through Chich�n Itz�, one of the new seven wonders of the world; walk around an ancient city, swim in sacred waters at cenote Ik kil and delight yourself with the best of Mexican cuisine. At Xcaret swim in underground rivers, enjoy traditional Mexican exhibitions and at the end of the night we invite you to witness the celebration of Xcaret Mexico Espectacular with over 300 artists on stage. Swim with Dolphins in Xcaret or Xel-Ha! Swim with Dolphins in Xcaret or Xel-Ha!! Visit Xcaret Plus or Xel-Ha All Inclusive with transportation and swim with the dolphins! Live the Equinox at Chichen Itza! Live the Equinox at Chichen Itza. Be witness of the Spring Equinox at Chichen Itza Mexico. $98.10 USD all inclusive tour. Only valid for visits on March 21st and 22nd, 2016. Live along with your family the most exciting activities at Xplor. Have fun at Xplor, a park in the heart of the forest where you can enjoy activities of adventure, with the most modern and safest equipment. Glide over amazing zip-lines, drive on and below the earth in amphibious vehicles, explore caves and marvel at the ancient formations of stalactites and stalagmites in the underground rivers. Xplor offers a delicious buffet with options for everyone, from salads to pizza for those willing to have more energy. Book and Save 5$ Off Xplor Park Cancun. Use coupon code: XP5AFF. Special 25th Aniversary - Deal for Mexicans! Special 25th Aniversary - Deal for Mexicans. Get from 10% to 25% Off for Mexican visitors! At admissions, tours, packages with or without transportation. Kids 50% off! Mexican ID must be presented of all the visitors at entrance booth or tour guide. If ID is not presented the difference will be charged. Promo code "PROMOMEX" must be used at purchase. Save 5$ Off Xcaret Eco Theme Park Cancun. Fun, Nature and Culture for the whole family at Xcaret Park. Xcaret is a natural park with more than 40 attractions for all ages, perfect to visit with the family. You can swim in underground rivers, stroll along trails in the middle of the jungle and explore the mysterious caves. Discover new colors at Butterfly Pavilion and the mysteries of the ocean in the Coral Reef Aquarium. Admire closely the fauna that inhabits the park; like deer, Jaguars, flamingos and exotic birds. There are several attractions to visit at Xcaret Mexico, such as the Mayan ruins, the Mexican Folk Art Museum, a traditional Hacienda Henequenera and the Chapel of Guadalupe. Book and Save 5$ Off Xcaret Eco Theme Park Cancun. Use coupon code: XC5AFF. Save 5$ Off Xoximilco Cancun. The Tour Xoximilco is a great choice to make new friends, celebrate an important event, or just be a part of this tradition of Mexico in its golden age. Enjoy a journey through canals on board a trajinera, dance and sing with live traditional music, enjoy delicious tastings of Mexican cuisine and toast with the classic tequila. Book and Save 5$ Off Xoximilco Cancun. With coupon code: XO5AFF. Buy Now The Perfect Day At Xel-H�! Admission + All You Can Eat & Drink + Activity. Immerse yourself in a world full of colors, and discover the diversity of the Caribbean Sea with Xel-H� Total. Enjoy an all-inclusive day with delicious buffet meals and unlimited beverages during your visit. Have fun with more than 20 natural activities and select one Optional Activity: an underwater tour with Sea Trek or Snuba, or an adventure at full speed over the sea with Adrenalina. Book Now and Use promo code: XHTOTAL at checkout. Book Now Xcaret Admission + Activity + Buffet Live a Complete Experience! Live a complete experience where you can enjoy Xcaret�s beautiful landscapes, swimming in underground rivers, and delighting with a buffet meal during your visit. Increase your fun choosing one of three Optional Activities: Adrenalina, Sea Trek� or Snuba�. Book Now & Use promo code: XCTOTAL at checkout. Last Chance Xel-Ha + Xplor at Best Price! 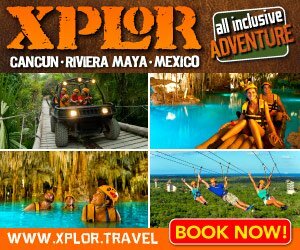 Adventure / Nature Best Combo Ever Xel-H� + Xplor All You Can Eat & Drink For $193.80. More Xel-H� Park is home to hundreds of species, such as tropical fish, birds, reptiles and abundant flora. Here you can enjoy bicycling through the land of Huh, jumping from the cliff of courage, have fun in the trepachanga and snorkelling while touring the river. Then enjoy a delicious buffet at any of our restaurants with different specialties and finally rest in the hammocks area. If you think that you still need more adrenaline, Xplor Park has the best adventure waiting for you. Challenge your senses and row through caves and caverns filled with stalactites and stalagmites; drive the amphibious vehicles and explore these lands; fly over the largest zip-lines in Riviera Maya. All this and many more adventures await you in the best adventure and nature parks at Riviera Maya! Tour Xenotes 5 USD Off!! Buy Your Tickets to Tour Xenotes & Save 5$ USD Off + Internet Discount. Take a break from the world and connect with nature, in a day full of exciting adventures in a completely magical environment. Xenotes Oasis Maya Tour will take you from your hotel to unveil four different types of cenotes near Cancun. A certified guide will accompany you through different activities in each cenote, to make sure you are having a lot of fun! This Tour includes delicious sweet bread, champurrado, coffee and fruit at the exit of the first cenote; and at the end of the tour a Glam Picnic with refreshing drinks. The adventure in cenotes that you won�t want to miss: Xenotes Oasis Maya Tour! Parque Xoximilco Cancun 5 USD!! Parque Xoximilco Cancun 5 USD. Compra tu entrada al parque Xoximilco Cancun y ahorra 5 USD adicionales al ahorro de precompra de internet. Experience the Mayan Encounter. Buy 2 days tour of a mystical journey with Xich�n Deluxe and Xenotes Oasis Maya Tours. Embrace the Mayan history at the archaeological site of Chich�n Itz�, wonder of the modern world. Get involved with the Mayan legends and nature in Xenotes Oasis Maya, visit four different types of cenotes and enjoy different activities. Get closer to the ancient Mayan culture with this 2 deluxe all inclusive tours! Maya Cities of the Riviera Maya!! Maya Cities of the Riviera Maya. Our day trips will take you in a Journey to the Past in Cancun and Riviera Maya. The ancient Maya world is ready for you to discover it! Select from 2 to 4 days of your vacation to admire the Mayan pyramids near Cancun and Riviera Maya. Choose Chich�n Itz�, Tulum, Cob� or a Cenotes Tour in deluxe transportation with bilingual guides. Black Friday Swim with Dolphins 2015!! Black Friday Swim with Dolphins 2015!! Save from 50 USD per person and swim with the dolphins in our parks. Valid for purchases from November 27th to December 1st, 2015. Valid for visits within a year from the date of purchase. Use promo code: BFD2015. Black Friday Free Transportation 2015!! Black Friday Free Transportation 2015!! Purchase any of our attractions and get free ground transportation from your hotel. Valid for purchases from November 27th to December 1st, 2015. Valid for visits within a year from the date of purchase. Some tours do not allowed children under 6 years old. Use promo code: BFT2015. Holidays 2015 Package Promotion!! Book the perfect gift; choose the best experiences Xcaret or Xel-H� + Xplor, Xoximilco or Xichen packages. Valid from November 19th, 2015 to January 10th, 2016. Use promo code: HOL2015. Family Package Special Price!! Xcaret Family Package! Two adults and two children special price package, includes admission, transportation and meals. More Enjoy with your loved ones more than 50 activities at Xcaret including shows, music, nature and culture. Swim together through underground rivers, discover the colors of beautiful birds in the middle of the jungle, where you and your family will create new memories that you will never forget. Xplor Fuego Tour - Save $5.00 OFF!! Xplor Fuego. At sunset, Xplor Park becomes Xplor Fuego, where extreme night adventures will be waiting for you. Feel adrenaline while going through trails and caves illuminated by fire created especially for you! Live the intensity of night gliding in incredible zip lines surrounded by the starry sky, drive by the rainforest in amphibious vehicles, through mysterious caverns and dive into the refreshing waters of an underground river. Besides all the fun, at Xplor Fuego you can enjoy an energetic buffet and all healthy beverages you want, giving you the most exciting night of Cancun and the Riviera Maya Adventure. Get this Xplor Fuego Tour - Save $5.00 OFF!! Use promo code: XPFWEB5USD. Xcaret Total. Buy Xcaret Admission + Buffet + Optional Activity. Use promo code: XCTOTAL. More Live a complete experience where you can enjoy Xcaret beautiful landscapes, swim in underground rivers and delight a buffet meal during your visit. At the end of the night, admire �Xcaret M�xico Espectacular� new presentation with over 300 artists on stage, a majestic enactment of Mexico�s history. You can also have fun with one of two Optional activities of your choice: Sea Trek and Snuba Family! Xel-Ha Total. Buy Xel-Ha All Inclusive + Optional Activity with a promotional price. Use promo code: XHTOTAL at checkout. More Immerse yourself in a world full of colors, and discover the diversity of the Caribbean Sea with Xel-H� Total. Enjoy an all-inclusive day with delicious buffet and open bar during your visit. Have fun with more than 20 attractions that Xel-H� has for you, and lockers, towel, restrooms and showers services. You can also select one of our optional activities, choose your favorite! Break This Spring 2015!! Two All-Inclusive Parks for the best price Cancun-Riviera Maya. Xel-Ha and MasterCard!! Buy Xel-Ha All Inclusive with MasterCard and get special 15% discount in optional activities! Xcaret and MasterCard!! Buy your admission to Xcaret or Xcaret Plus with MasterCard and get a second day admission for free! Xplor And MasterCard!! Buy Xplor All Inclusive with MasterCard and get a special 10% discount in your photos package! Use promo code: XPMASTER. SeaTrek 10% Off at Xel-Ha!! Walk under the sea in Xel-Ha: SeaTrek 10% Off!! More In Xel-Ha is possible to walk on the seabed. With the help of modern technology that ensures maximum security, even non-swimmers can enjoy the experience of seeing the marine life of the most beautiful natural aquarium in the world. Surround yourself with colourful fish and the most varied and amazing vegetation of the Caribbean Sea. The Sea Trek® helmet allows you to breathe comfortably, naturally and safely under water. Sea Trek® diving requires no training; our experienced guides will accompany you during your walk underwater. Enjoy a walk like you never thought! Come to Xel-Há and enjoy a unique EXPERIENCE. Swimming with Sharks at Xcaret - Save 10% Off!!! Swimming with Sharks at Xcaret - Save 10% Off!!! Shark interactive adventure at Xcaret. Enjoy this 45 minutes activity with instructions, show, interaction and free swim. More It sounds impossible... but it is real! Xcaret Park gives you the opportunity to interact with nurse sharks in a safe and fun way. Learn about the way of life of this interesting species in a unique activity of swimming with sharks in Cancun and Riviera Maya. Of all marine creatures, none draws more curiosity and interest in humans than sharks; overcome your fears and dare experience Sharks! Interactive Adventure. Festival of Life and Death 2014!! Festival of Life and Death 2014!! From October 30th to November 2nd, take part of this celebration at the 9th Festival of Life and Death Traditions in Xcaret. Valid for visits from October 30th to November 2nd, 2014. Live Xplor or Xplor Fuego And Ignite The Party! Live Xplor or Xplor Fuego and Ignite The Party! Purchase Xplor and Xplor Fuego and get $10 off for Coco Bongo. Valid from July 21st to August 31st, 2014. Restrictions apply. Online purchases only. 10% Off Plus Save 5USD Discount to Xel-Ha Park! 10% Off Plus Save 5USD Discount to Xel-Ha Park. Purchase your ticket to Xel-Ha Park and get 5 USD discount. Valid for purchasing from July 17th to August 31st, 2014. This promotion cannot be combined with other promotions. Zip Bike 2x1 in Xel-Ha!! Zip Bike 2x1 in Xel-Ha. Buy your ticket to Xel-Ha all inclusive (with or without transportation) and add to your experience zip bike ride 2x1. Valid for purchase from July 22nd to Auguts 31st, 2014 and visits within a year from the date of purchase. 10% Off Plus Save $5 USD Discount to Xplor Park! Get 10% Off Plus Save $5 USD Discount to Xplor Park. Purchase your ticket to Xplor Park and Get 5USD Discount. Valid for purchasing from July 22nd to July 31st, 2014. This promotion cannot be combined with other promotions. The Activities You Must Do This Summer! 2014. Choose three or two of the best parks in Cancun and Riviera Maya and save money. Mayan Riviera in the Mexican state of Quintana Roo with the idea of building his dream house. However, when he began to clear the land he started uncovering ancient Mayan cenotes, sinkholes and beautiful underground rivers, park open to the public. Xcaret is one of the most famous attractions in the Cancun-Riviera Maya destination, an eco-archaeological park where you can experience the natural and cultural richness of Mexico. Xcaret is a majestic park by the sea where you can relive the history of Mexico through colourful traditions and shows, endless activities and beautiful native flora and fauna.